Combat is a way of life on Golarion—warriors across the world are constantly in search of the next fight, powerful technique, or weapon in order to improve their skills. 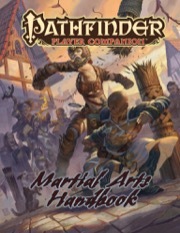 Pathfinder Player Companion: Martial Arts Handbook offers new archetypes, feats, and equipment for adventurers of all kinds who rely on their physical prowess in combat, whether they turn themselves into living weapons with their punches and kicks or unleash their mastery with nunchaku and swords. Fighting styles from across Golarion, including battle dancers, who use impressive maneuvers to dance around foes, and the black powder vaulters of Alkenstar, who use acrobatics to leap across the battlefield! Dozens of new feats for all kinds of martial artists, including feats to improve combat maneuvers and improvised combat, combination feats, and style feats like the high-flying dragonfly style! New abilities that draw upon the innate power of the body, including ki abilities for both qinggong monks and unchained monks, ninja tricks, and kineticist talents!